A green swimming pool is the bane of any pool owner’s world. 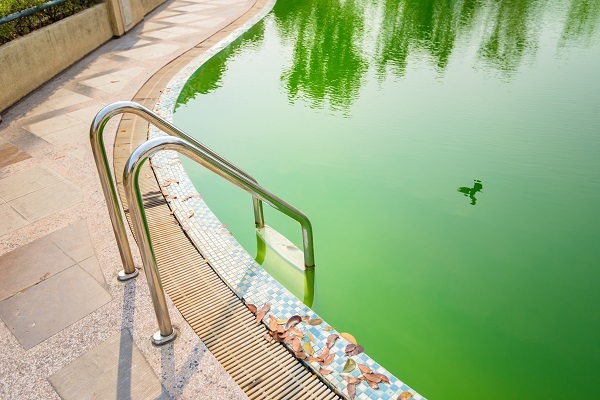 The green tint of pool water is caused by a bloom of microscopic plants called algae. Algae are constantly growing in a pool. The chlorine is simply keeping it in check. A day or two of neglect will let the algae grow out of control and turn your pool water green. You might want to consider inground pool repair, as the algae could be aided by an external contaminant coming in through a cracked pipe or pool wall. In this case, Mr. Pool offers inground pool crack repair and inground pool pipe leak repair. However, there is an immediate method to treat the water in the pool. Algae grow when chlorine in your swimming pool falls to below 1ppm (parts per million). This results in an algae bloom. In order to kill the algae in the water, you need to administer a chlorine shock. A chlorine shock can only be done at dusk or at night. The chlorine used in the shock is unstabilized. So, it will be prone to evaporating out of the pool during the day, reducing the effectiveness of the shock. The amount of chlorine required depends the on the color of the pool water. A small amount of algae in a pool only calls for a double shock. This means 2 pounds of chlorine per 10,000 gallons of water in your pool. Dark green water is indicative of a larger algae bloom. In this case, you will need a triple shock or 3 pounds of chlorine per 10,000 gallons. This is the worst possible state a pool can be in. Blackwater requires the harshest possible shock, a quadruple shock: 4 pounds per 10,000 gallons. The next day, if the shock has worked, you should notice the pool water has turned gray and cloudy. This is the desired result as dead algae turn gray. Run the pool filter continuously until the water is once again clear, and continue with your normal pool maintenance. Leading the pack in terms of inground pool repairs, Mr. Pool is the go-to agency with inground pool leak repair and inground pool vinyl repair. To find out more, contact us today.